So, I know you can't believe anything you read in a newspaper, but if the newspaper calls you and tells you something, then can you believe it? How about if both Pittsburgh newspapers call? We've heard that Judy was acquitted of two of the three charges brought against her, but she was fined the maximum for the third charge, which comes to a grand total of $100. It'd be nice if the county would notice that the prosecution wasted seven years trying to get a verdict, and failed so future folks don't have to go through all of this. Check out Mom's post and Jon's comments afterwards for the update. 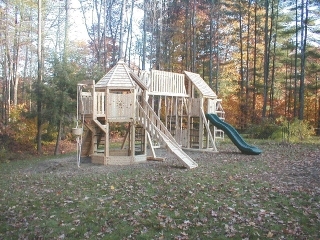 Grammy and Papa bought a playground for their backyard, "In memory of Isaac and in honor of all [their] grandchildren." Two weekends ago, we went to New Hampshire to help them assemble it. It was a fun and busy weekend. The playground is big and immensely fun. 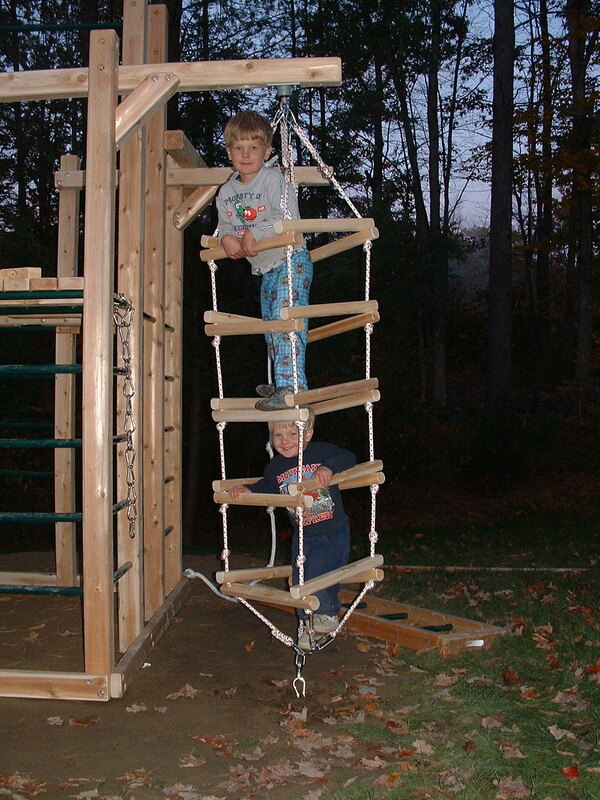 Even though we were not able to finish it that weekend, it was assembled enough for the boys to clamber all around. Jonathan said, "This is the most fun thing ever!" All the playground pictures are on our pictures page. I was just served with a subpeona to appear for Judy's trial on September 22nd, with a preparation meeting on September 8th. Probably not what Heather wants to be thinking about with our baby due any day now. I told the detective that with our baby coming, we might not be able to make it, and he said to call the prosecutor, but she is "out of the office" until Monday, so I assume she won't get the message in time. Oh well, I guess that is what they get for not notifying us sooner. I had meant to post that the trial was going to be on March 17th, but I just found out that it has been postponed until September 22. So, more waiting. Crazy. The hearing to argue pre-trial motions in Judy's case has been continued to October 9, 2007. Judy's Expert Witnesses will present written argument to the judge at that time and he will decide whether to dismiss the case or go to trial. Just because we were too busy to post does not mean we did not think about Isaac this Thanksgiving. Tuesday the 21st was his 4th birthday. At women's Bible study we sang a song about the people of God, the Church, Christ's body - and one phrase reminded me of the support in grief that they were to us in those days and following. Thanksgining Day itself this year was the anniversary of Isaac's death. We got a sweet email from Grammy in which she gave thanks for all three of her grandsons. Other relatives and friends also remembered with us. I, too, am thankful for my three boys, for the growth in my spirit from the trial of Isaac's death, and for the heightened appreciation, and thus enjoyment, of the lives I am blessed to spend mine with on this earth. Unless we hear otherwise, Judy's hearing is still on for Thursday. I just spoke with Judy and she asked me to post a reminder regarding the hearing. Thursday's hearing will include witness testimony on both sides which promises to be emotional, to say the least. This is NOT just a formality. The judge can make preliminary rulings after hearing both sides as to what happens from here. Her attorney remains positive, but the outcome is still very uncertain. The only thing she is certain of is that God is in control. Please make this a matter of utmost concern and prayer. Pray for wisdom for her attorney, fairness on behalf of the judge and that truth will prevail in the court room. Pray that any attempts to promote injustice will be blocked and that Judy and her family will be uplifted with strength and renewed hope and confidence. Also, Judy has been busy with a wedding for her daughter, a mid-term exam (tomorrow) and just getting over a cold, so please pray for that as well.